Not all fruits and vegetables are created equal. And when it comes to weight loss, pears might be the proverbial cherry on top! It’s strange, but these delicious fruits are often overlooked in place of apples and bananas, but I’ll tell you, biting into a sweet juicy pear is something I’ve been doing for years. They come in a variety of consistencies and colors, but almost always satisfy my craving for something sweet and juicy. And new research is showing that pears are one of the best fruits to help you lose weight and lower the risk of a number of diseases. If you’re serious about battling the bulge, including pears into your diet is something that can really help. Pears are nutrient-dense and packed with fiber, vitamin C and phytochemical flavonols. Pear skin is especially important, being rich in both fiber and anthocyanins. Pears with red skin in particular feature antioxidant anthocyanins, which can help battle certain cancers, heart disease, diabetes and obesity, while battling inflammation. Now these aren’t the only nutrients found in pears, but they are some of the most noteworthy. Phytosterols battle cholesterol, while fiber offers a multitude of benefits I’ll address shortly. You may notice that pears are high in sugar—which is why they are so sweet. The sugar in pears is naturally occurring and does not spike insulin levels. The high fiber limits the impact these sugars will have on blood glycogen, making pears perfectly safe. In fact, pears only have a glycemic load (GL) of four. Pears are gold in more ways than one and the results of a new study shows that people who eat pears are more likely to lose weight than those who don’t, regardless of caloric intake. The study was featured in the Journal of Nutrition and Food Sciences. After tracking the eating habits of nearly 25,000 individuals for eight years, researchers found that not only did people who ate more fruits and vegetables lose more weight and were less likely to be obese than those who ate less, but those who ate pears in particular were more likely to lose weight or be at a healthy weight. The research indicated that people who ate pears were 35% less likely to be obese than those who didn’t. An older study conducted by the Harvard School of Public Health also uncovered weight loss qualities in pears. Researchers followed the eating habits of 130,000 U.S. adults for more than two decades and noticed that a weekly serving of pears was tied to a one pound reduction in weight over a period of four years. Now, are pears considered a “magical” weight loss aid? It’s hard to say. It is possible that people who eat pears may have a healthier overall diet and lifestyle, but the data supporting pears is pretty unique; especially when caloric intake is controlled. Pears aren’t capable of turning a poor diet around, but they can definitely make a mediocre or good diet better. A very unique feature of pears is that they can satisfy a sweet tooth instantly. They are extremely sweet and act as a great substitute for candy when cravings hit. And trust me, I can wholeheartedly attest to that! Perhaps a reason why pears are so closely associated with weight loss and weight management is that they keep you feeling full. Just one medium-sized pear can create the sensation that you just had a meal. How? Because of its high-fiber content. The fiber in pears slows down its absorption and creates a feeling of fullness. Now, not many sweets can do that! Pears also feed good bacteria, which means they break down and deliver nutrients to your hungry cells. Healthy gut bacteria are essential to good health and play an important role in weight management. In fact, research has shown that diverse and healthy gut bacteria can result in weight loss, especially around the belly region. Fat in the belly region is actually more dangerous to your health than fat virtually anywhere else, so in this regard pears are extremely valuable. The fiber and phytosterols in pears help remove and stymie the production of “bad” LDL cholesterol. Fiber encourages easy blood flow through your arterial system by encouraging the removal of LDL cholesterol deposits along arterial walls, helping to lower blood pressure and the risk of heart disease, heart attack and stroke. Aside from the fact that pears help fight obesity, which is a risk factor for type 2 diabetes, they also help reduce the risk in other ways. The soluble and insoluble fibers found in pears help slow the absorption of sugar and reduce insulin sensitivity. Furthermore, the anthocyanins in red pears can help fight inflammation. Your stomach can be an active place and it’s filled with acidic bile that acts as both a friend and foe. Yes, you need it to help break down food, but it can also cause pain and even lead to disease. The fiber in pears can bind to acidic stomach bile in the intestine and limit the production of cholesterol. The lower your cholesterol, the less chance you have of getting heart disease. There are different types of acidic bile in your stomach. The bile that sits down at the bottom is known as secondary bile acid, and high concentrations of it can increase the risk of colorectal cancer. Pears can lower the concentration of this bile thereby lessening the likelihood that cancer will develop in the colon. Lowered risk of gastric cancer is also associated with pears, but not because of the fiber. The phytonutrients in pears, cinnamic acids, have been shown to decrease gastric cancer risk. Add pears to your salad: You can either add them raw or fry them shortly to soften them up and extract some of the natural sugars. Pears taste great in a salad with crumbled goats cheese and walnuts. Add pears to oatmeal, cereal or yogurt: A great way to have a high-fiber breakfast is to add some diced pear and almonds to plain oatmeal. Pears provide that added texture and sweetness to turn an otherwise boring meal into a sweet treat! Add pears to your meat dishes: Yes, you can incorporate pears into your meat dishes (particularly pork and chicken). Caramelize the pear and add it to balsamic vinegar and onions to make a sauce and pour it over a pork chop or chicken breast. Eat a pear as a snack: Pears make perfect on-the-go snacks. Pears for Weight Loss and More! If you want to lose weight and improve your health, then don’t walk past the pears the next time you’re at the grocery store. Great taste and nutrition is the perfect pear, if you ask me! How Apples, Pears, Berries, Grapefruit and More Can Cut That Belly Fat! O’Neil C.E., et al., “Fresh Pear Consumption is Associated with Better Nutrient Intake, Diet Quality, and Weight Parameters in Adults: National Health and Nutrition Examination Survey 2001-2010,” Journal of Nutrition & Food Sciences, 2015; doi: 10.4172/2155-9600.1000377. Lila, M.A., “Anthocyanins and Human Health: An In Vitro Investigative Approach,” Journal of Biomedicine and Biotechnology, 2004; doi: 10.1155/S111072430440401X. “Pears, raw [Includes USDA commodity food A435]”; http://nutritiondata.self.com/, http://nutritiondata.self.com/facts/fruits-and-fruit-juices/2005/2, last accessed December 10, 2015. 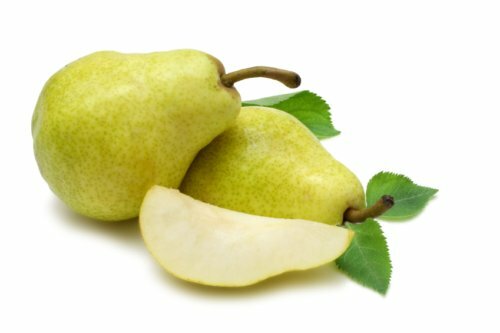 “What’s New and Beneficial About Pears?” Whfoods.org; http://www.whfoods.com/genpage.php?tname=foodspice&dbid=28, last accessed December 10, 2015. Rettner, R., “Some Fruits and Vegetables are Better for Your Waistline,” LiveScience web site, September 22, 2015; http://www.livescience.com/52268-fruits-vegetables-weight-loss.html.